In fact they cite their genre as “Death Pop” on their Facebook page. 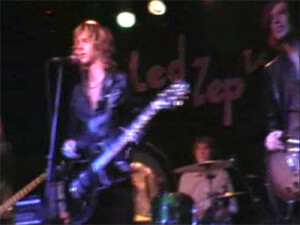 Some years ago when I was the lead singer of Led Zep Too, and we were playing a gig on the edge of England in Lowestoft, we were met by a group of young fans, who were themselves musicians in a band called Plan Nine. It was a terrible name for a band, but they played bloody good music, and did it very well indeed. They were superb showmen as this video shows them working a modest audience as hard as any band could. So much so that we were happy, indeed lucky, to get them to support us at a gig at The Purple Turtle in Camden. In fact they were more at home in the venue than we were if I am honest. Based in deepest Suffolk the lads then moved to London, attending college studying aspects of music in the capital. Later I saw them headline with support from The Pale Blue Eyes, and JB3 one of the most enjoyable gigs I’ve ever attended, as all three bands were good enough to have been the headline. The Fearless Vampire Killers don’t take themselves completely seriously, but their music is good enough to justify their outlandish appearance, and self deprecating humour. Sorry for the preamble, the reason is that the bass payer, Drew Woolnough, from that band became the bass player of FVK. Now, I know I have mentioned this before but I’ll say it again. When you find a band you like you don’t want them to split up, and if they do, you often don’t follow too closely what they get up to afterwards, even though they send you links to their new bands. I know I am not the only one, because my last band “Surrogate Suns” never even played a gig but it still has more Facebook fans than the new band “Badly Worn Toy” even though BWT has played quite a few gigs now; just sayin’ . So, yeah, I followed a link and I liked a page. Then I did nothing for ages, until I happened to see a link to a video of the Fearless Vampire Killers that had been posted on the official Kerrang website. So now I was quite intrigued because I hadn’t realised they were getting so much attention. The video was pretty funny, a sort of spoof Dave Grohl’s Sound City documentary, with a great big dollop of the attitude of “The Office” with a lot of attention focussed on the “legendary Plodonator” possessed by the spirit of Elton John! It is quite possible that FVK are the biggest band I have reviewed in this blog so far, having – as they do – over twenty thousand facebook likes, nearly twice the number of the 1967 film from which they take their name. 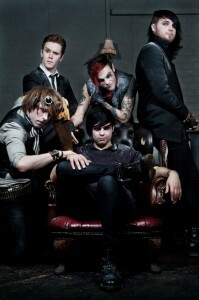 Fearless Vampire Killers have their own Youtube channel with substantial a number of very professional looking videos, showcasing their excellent songs, as well as their stunning “steam punk” image, and of course their gentle self mocking style of humour. Fearless Vampire Killer merchandising looks professional and extensive. Prices on this sort of merchandising deal are never cheap £15 for a tee shirt, £25 for a hoodie, and the supplier takes a cut, but it has the advantage of not requiring a ridiculous capital investment from the band, and is in line with the prices paid for official merchandise from big bands. I must confess, that I am not well enough versed in the genre to start comparing them to bands. Since most bands hate being told they sound like such and such maybe that is a good thing. The sound is modern heavy rock rather than being anything like classic rock from the seventies. Vocals are usually clean rather than roared or screamed, definitely a plus from my point of view. I’d say the visual image gives you a good clue as to the sort of thing. But at the end of the day, nothing beats going to their site and checking out some tunes, or better still heading off to one of their numerous gigs. Currently they are scheduled to visit Doncaster, Tunbridge Wells, Bristol, and Wrexham and many others in between, so they certainly get about. Fearless Vampire Killer are signed to “Goremount Records” who’s entire artist roster appears to consist of The Fearless Vampire Killers, and I believe is run by the five members of the band. This is the way to do things of course. Why be “unsigned” when you can be “signed and independent”? This is the same approach of bands like Djevara, and The Reasoning, and it works. You either have to have your own record label or you get in touch with one like this and do a deal to come under their umbrella. Forget Sony, or Warner.